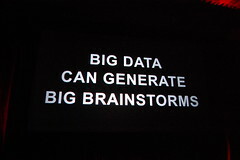 Big Data has become one of the hottest buzzwords in business. With it comes both pros and cons. Big Data has become one of the world’s biggest business buzzwords, with good reason. It does have the power to transform human resources and talent management. However, like any new jargon, Big Data does come with some baggage. One of the “cons” is Edward Snowden, the “whistleblower” who exposed the NSA’s program of collecting vast quantities of American phone call records. He claims governments use Big Data to “spy” on its citizens. It’s certainly odd that those who are advocating privacy have placed all the blame on the government. They miss one thing about those phone records. Why should government get the bad rap, when major corporations (like Verizon) already collected the Big Data in question. It was already in their possession! Verizon simply turned over existing records to various government agencies. Apparently, our “privacy” was no more comprised before the government got their hands on those records; before that, there was just a different set eyes looking at us. Snowden is currently the subject of an international manhunt, to respond to allegations of treason, spying or (whatever the hell they say he did). On the other hand, according to “Big Data Is a Big Deal” on Forbes.com, Big Data is something that can be extremely useful to Human Resources and Talent management. Massive amounts of information, with the proper filtering and algorithms, could provide the insights that can be valuable—with additional data streams used to verify potential hires. The key behind Big Data is giving companies the ability to learn new information torrents to identify trends. Used properly, these streams can examine high-performing employees as a way to predict future behavior, thereby allowing businesses to develop a template to evaluate future hires. In the past, resumes and interviews were the best ways to determine quality hires—with some gut instinct thrown in for good measure. Now science is part of the mix. “Recruiting has always been an art, but it’s becoming a science,” Dan Shapero, LinkedIn VP of Talent Solutions and Insights tells Forbes. Instead of waiting for the perfect hire to come to a business, Big Data permits recruiters, hiring managers and human resources professionals proactively look for high quality talent. On the other side of the hiring equation, job seekers can apply Big Data principles to increase visibility. With a larger online footprint, the chances of a company becoming aware of your particular talents increase. Social media and networking sites (like LinkedIn) allow you the perfect opportunity to make yourself known. For both job seekers and those companies looking for talent, the best advice for using Big Data in your search is to be selective. It can be easy to get stunned by the amount of information in “Big Data”—hence the name. There is just too much info out there. The possibility of becoming overwhelmed is why the best approach is carefully choosing the outlets for your online presence. If there is one thing you can trust about the Edward Snowden/NSA data fishing expedition, it is this: most Big Data can be ignored. It’s just babbling. However, if you use the right filters and algorithms and a little detective work, you could get a diamond in the rough—your next superstar employee! Read the original Forbes article here.